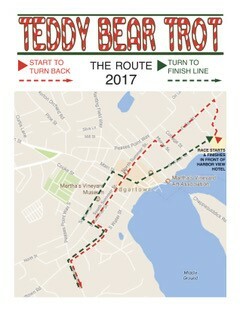 The Teddy Bear Trot. 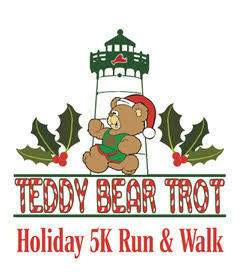 is a 5K Run and Walk through picturesque downtown Edgartown. The course begins at the Harborview Hotel, overlooking the Edgartown Lighthouse, and continues through town before finishing back at the hotel. The event is offered in conjunction with the Harbor View Hotel's Teddy Bear Suite, decorated with hundreds of teddy bears and dedicated to fundraising for the Martha's Vineyard Boys and Girls Club Happy Healthy Kids program. Prizes will be given for age groups, as well as best holiday costume. In addition, there will be a 1/2 mile Fun Run for kids under 10. Fun Run begins at 9:45 am, 5K Run and Walk at 10:00 am. Same day regisration is from 8:30-9:30 in the Harbor View Hotel Lobby. Wear festive clothing, holiday hats, costumes, etc. !